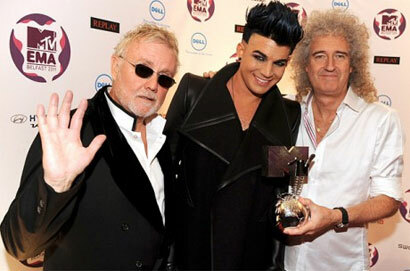 Queen will head out on a 19-date trek across the US with singer Adam Lambert. A tour that guitarist Brian May has promised will be " the closest that you'll ever get to see Queen as it was in our golden days." Queen, minus original bassist John Deacon, have once again selected the 2009 American Idol winner to front the group after collaborating last September at the iHeartRadio Music Festival in Las Vegas. Adam told Rolling Stone Magazine, "I think the thing that's really special is that this is the real deal. This is live. In today's music world, you go to a concert and you're getting a lot of playbacks. There's click tracks. It is what it is. I'm not hating on it. But this is the real deal. This is pure. I'm singing all the vocals with these guys on vocals. It's purely organic. I think in today's day and age, it's very exciting for an audience to see something that has that much heart." Hitting back at Freddie Mercury fans who are not huge fans of Lambert’s covers, Brian insists that the tour will not be ‘an imitation’ of the Mercury days and wants to give younger fans the chance to see Queen live and make new memories. May added that “They'll be a lot of newness about this. I think that's very exciting. It'll be loud and dangerous and all the things that people used to look for in us.” The former frontman and iconic performer passed away in 1991 of bronchopneumonia, a complication of AIDS. Queen and Adam Lambert will kick off their US tour in Chicago on June 19th 2014.